WITH THE PARTICIPATION OF: Öykü Aras (TR) | Ronald Bal (NL) | Natasha Bourke (IR) | Vincent Campos (FR) | Brooke Carlson (AU) | Hannah Clark (UK) | Giorgia de Santi (IT) | Lisa Freeman (IR) | Laura Gildner (CA) |Joy Harris (US) | Graham Martin (UK) | Eva Martino (IT) | Ashley-Louise McNaughton (UK) | Inês Miguel (PR) | Ana Morvlje (SL) | Kimvi Nguyen (UK) | Fabiola Paz (CL) | Katya Petetskaya (RU) | Alicia Radage (UK) | Cristiana Zeta Rolla (IT) | Francesca Carol Rolla (IT) | Tyska Samborska (PL) | Ieva Savickaitė (LT) | Aaron Schmitt (DE) | Marcel Sparmann (DE) | Keike Twisselmann (DE) | Gülhatun Yıldırım (TR). + READ HERE the review of the final public presentation by Penzo+Fiore. IPA VENICE 2016 consisted of two workshops groups: a workshop facilitated by Jürgen Fritz and VestAndPage's intensive MayDay workshop. Both groups were visited for one day each by the guest teachers, Italian sound/performer duo Andrigo&Aliprandi. Open evening sessions allowed for exchange between the two groups, and participants lived and worked together throughout the week. A final public presentation on Saturday, June 4, rounded up this intensive workshop camp. Jürgen Fritz worked as a theatre director, curator and actor, and since 1984 as a performance artist. He is the co-founder of the performance group Black Market International and of the International Performance Association (IPA), the Platform for Young Performance Artists and the IPA Summer. Since 1995 he is a lecturer in performance art at different universities in Germany. His conceptual approach in his performance works is characterized by concentration and precision. For that he uses simple materials such as bamboo sticks, a bell or marbles with which he creates inspiring pictures. WORKSHOP: In the center of Fritz' interest in performance art is the person of the artist. By him/her and through him/her the performative image develops. From this, several questions for the workshop can be deduced: What is a performative image? How is the performative image developed? What is presence? With what tools can performance artists work on "presence"? The workshop starts with concrete and intensive physical exercises. These exercises do not serve to teach performance art, instead the preoccupation with these tasks throw the participants back onto themselves and hence enhance the confrontation with their own aesthetic experience. Existing insights, images or experiences should be activated and brought into action. In a negotiation of the topic "presence", the participants shall recognize themselves within the given situation and in relation with the other participants. Questions about impression as physical perception are the subject of the argument. Presence in this sense means successfully setting oneself in relation to the situation of the performance as an action in the here and now. The workshop is structured in two parts: The first part is dedicated to group performance, dealing with issues of common rhythm, impulse and perception. The accompanying exercises set the foundations for a common approach to performance art. The second part deals with the personal approach to the topic, material and strategy of a solo performance. In the concluding public presentation these two fields are merged. The basic guideline of this workshop is to support the participating artists in their individual approach to performance art. By questioning the individual borders of social and gender codes, we try to create an inspiring and challenging situation allowing for new aspects and possibilities in one's own work. VestAndPage German artist Verena Stenke and Venetian artist and writer Andrea Pagnes have been workings together since 2006 as duo VestAndPage, generating art in the mediums of live performance, filmmaking and writing, and as independent curators. Their practice is contextual, process-led, situation-responsive and conceived psycho-geographically in response to social contexts, natural surroundings, historical sites or architecture, always subdue to the given conditions. Their work examines the relationship between ephemeral performance art, research, writing and filmmaking, such as in the art film trilogy sin∞fin The Movie and the recent performance-based art film Plantain | Spitz-wegerich (2015/2016). 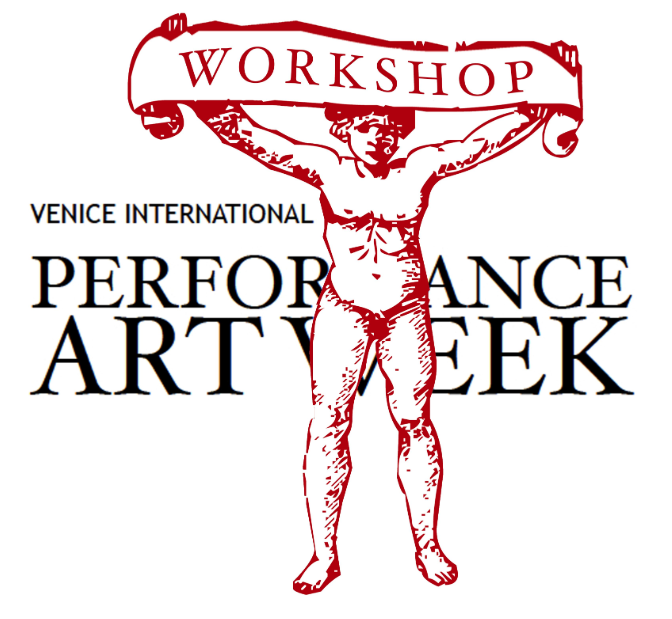 Stenke and Pagnes are the initiators and independent curatorial force behind projects such as the live art exhibition project Venice International Performance Art Week (2012/2014). They are experienced workshop faciltiators and collaborate with international theatre companies, cultural institutions and humanitarian organisations in production and education, presenting lectures and a methodological workshop series. Their research and poetic writings have been published in various international books and magazines of contemporary art. WORKSHOP: MayDay is an intense 7- to 9-days workshop based on daily 24-hour conditions or focuses. Practical and physical exercises are framed within these daily focuses. MayDay, with its extended time and durational tasks, allows the participants to enter into a concentrated process of artistic and personal research. MayDay follows the traces of our cultural, spiritual, corporal mutations and conflicts. During the practical exercises, under various conditions, the participants are provided with means to conceive, develop and realize a performance, mainly only using their own body as a tool and on the following common grounds: To exercise and research on a changing daily basis • To work towards touching point zero in perception, introspection, judgement (on one self and on the others) and intention, to then rebuild a new way of authenticity-based perception and expression, for finally transforming visions and ideas into a concrete artistic action. • To take distance from merely being virtuous by establishing, evaluating, and energizing the personal action in se. • To free oneself from common behavioural patterns so as to create new ways of encountering, collaborating and living. • To overcome the fragile constituent limits, may they be based on physicality, fears or social patterns. • To touch and strengthen the most human inner sensors in order to activate personal and universal memories, for using as germinal matter for future artistic substance. Actions and exercises are innovative but inspired by Dynamic Breathing, Social Theatre, Living Theatre, Macro and Micro Spherology, Inner Library, Liminality, Archetypes, Rituality, Memory activation, Body-Space-Object, Time-Duration-Rhythm, Voice/Sound, Emotional Atmosphere, Inter-activity. The goal of the workshop is to provide the participants with the necessary theoretical and practical knowledge and artistic sensitivity to conceive a final, individual or collective performance.